Published in 1868 and widely known as Brahms' Lullaby. The lyrics of the first verse are from a collection of German folk poems called Des Knaben Wunderhorn and the second stanza was written by Georg Scherer (1824–1909) in 1849. The lullaby's melody is one of the most famous and recognizable in the world, used by countless parents to sing their babies to sleep.The Lullaby was dedicated to Brahms' friend, Bertha Faber, on the occasion of the birth of her second son. 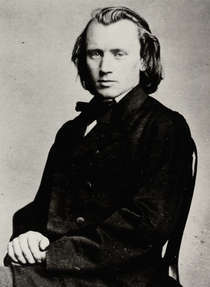 Brahms had been in love with her in her youth and constructed the melody of the Wiegenlied to suggest, as a hidden counter-melody, a song she used to sing to him.The lullaby was first performed in public on 22 December 1869 in Vienna by Louise Dustmann (singer) and Clara Schumann (piano).